When Disney released the first teaser of their live-action adaptation of The Lion King a couple of months back, we were in awe of the little Simba. The original The Lion King animation movie was a classic, but the special effects used in rendering the lion cub in this version and make him feel so real-life like was astounding, to say the least. But then, director Jon Favreau has already attempted something similar in the past with the 2016 film The Jungle Book, that was a resounding success all over the world. The Lion King could go down the same path, and if you have any doubt, do watch the new official trailer of the film. The Lion King Teaser Trailer: Get Ready to Relive Your Childhood With Jon Favreau’s Remake of the Classic. The trailer begins with the voiceover of Scar, the villainous lion responsible for the death of Simba's father, Mufasa and his banishment into the jungle. 'Life's not fair. Is it, my little friend?' asks Scar to Simba and seeing how the little cub has to endure after his father's death (not shown in the trailer), we can agree with that. Mufasa's line also hits the sweet spot when he tells Simmba that a true king searches for what he can give, leading to a lovely scene where little Simba's paw falls into a larger lion's footprint. 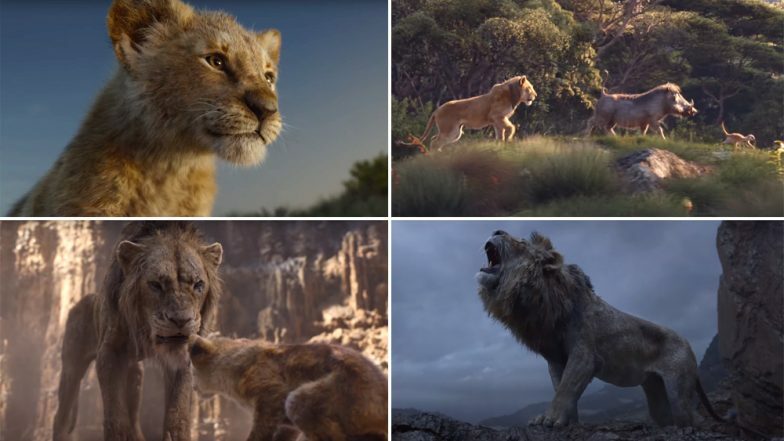 The trailer then goes on to offer glimpses of Simba's journey from a banished cub to, in Mufasa's words, 'finding his place in the circle of life'. The Lego Movie 2, Aladdin, The Lion King, Star Wars Episode IX - 30 Hollywood Non-Superhero Movies of 2019 We are Super-Excited About! The trailer offers some terrific CGI, beautiful visuals of the forest where the film is set and amazing background score. Towards the end, we also get Timon and Puba getting ready for a song! Overall, the trailer is a damn hit and it increases our confidence about the movie. The Lion King features the voice-cast of Donald Glover, Seth Rogen, Chiwetel Ejiofor, Alfre Woodard, Billy Eichner, John Kani, John Oliver, Beyoncé, and James Earl Jones. The movie is all set to release on July 19, 2019.